5:38 p.m. — Welcome to the Quacktown LiveBlog! Just a quick observation: If the rest of the country worked at the pace in which Oregon scores points, not only would we be miles away from the fiscal cliff traveling in the right direction, there might be peace in the Middle East and people on Mars. Seriously. I left the room for 12 minutes. 12. It’s not like I departed for an eternity. And It’s not like I came back after 5:30 either. But, speaking of ridiculously fast, DeAnthony Thomas’ face no longer belongs on the side of a milk carton. 94 yards. Housed. And just in case this is Chip Kelly’s last game donning the ambiguous green and yellow, Oregon pulled off their patented Gotcha! conversion tactic to perfection. Oregon 8, Kansas State 0. 5: 56 p.m. — For those of us not in Arizona, hearing Brent Musberger call the Glendale air “cold” is approaching disrespect. Just sayin’ Brent. And this might just be DAT’s game, because the purple jersey’s looked absolutely glacial compared to the shifty little back on his last 18-yard run. 6:00 p.m. — Did I say glacial? I meant inert. And in the worst sort of way. He is so much more athletic than anyone on that defense appears to be right now, and his 26-yard catch-and-run TD on a harmless bubble screen is some pudding worthy proof. Oregon 15, Kansas State 0, 3:46 to play in the first. 6:07 p.m. — IFO. EKPRE-OLOMU. I know, it looks weird with the dash. Doesn’t have quite the desired affect. 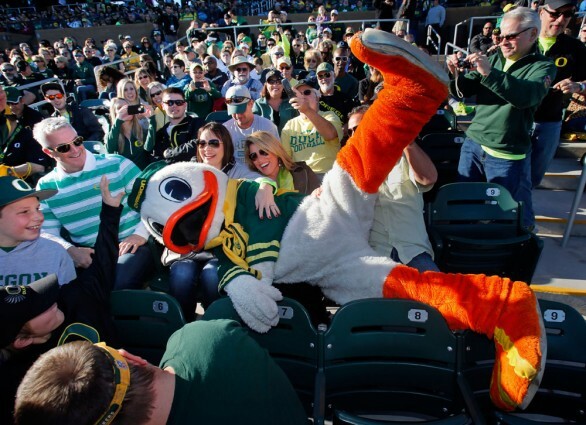 But he is my favorite Duck by far, and the hit he put on Klein — following a wonderful deflection — are reasons No. 1,463 and 1,464 why that is so. Terrance Mitchell, however, has some work to do. An early, unnecessary pass interference penalty doesn’t scream “prepared,” Terrance. Lock it up. 6:14 p.m. — Kansas State is driving, Oregon’s front seven is making a colander look impermeable and the roof of the University of Phoenix Stadium (ironically totally unassociated with any real college) eerily resembles the squadron of spaceships in Independence Day. 6:18 p.m. — Addendum to the previous statement: OUTSIDE OF THE REDZONE, the Oregon defense is looking like a sieve. And as I write that, Oregon’s pass rush exhibits the discipline of this kid during the Marshmallow Test, ignores the concept of containment, and even with the fantastic effort from IEO (I can’t blame him, won’t blame him. Deal with it. ), Collin Klein still managed to punch in the 3rd-and-goal busted play with a lunge. Oregon 15, Kansas State 7, 13:26 to play in the second. 6:26 p.m. — Well that was strange: Marcus Mariota threw the best ball he has thrown all season, undoubtedly. Kenjon Barner, who ran a picturesque wheel route, had beaten his defender by a step and a half. And then, just as a touchdown call was dangling from Musberger’s lips, Barner simply never put his hands up. He didn’t see the ball. And that was pretty much it. Instead of a touchdown, it was a total non-thing. K-State ball. 6:39 p.m. — In the nicest, most doting way possible, Klein truly is the Master of Mediocrity. The guy is like a genetically modified seven-yard-gaining machine. It’s like he has no idea how not to get to the sticks, or, if he decides to use his interesting arm angles, he has no clue how not to throw for seven yards. It’s wild. He’s the simultaneously the scariest offensive player the Ducks have faced (because he is unstoppable if the thing you’re trying to stop is moderate gains) and the least scary (because he has about as much home run power as a young Ray Ordoñez. But, in true jinxing fashion, Klein failed to engineer a TD inside the five, and K-State was forced to kick. Oregon 15, Kansas State 10, 5:21 to play in the second. 6:49 p.m. — If this is Chip Kelly’s last game wearing a visor on the Oregon sideline, this can’t be the way he pictured it. The offense is anemic, the defense is getting schooled by a kid who was home schooled, and his fake punt was not so good. At least Brian Jackson knocked down the Kansas State gadget play. 6:53 p.m. — So Ty Burrell is on the sidelines. He was at the Jazz game last week, too. Don’t know if they’re related, but for the sake of awesome coincidence, we’ll assume they are. Oh, and Kansas State is inside the Oregon 30 again. 6:55 p.m. — And Oregon catches a break! Wide left! Kickers have the worst jobs ever. 6:57 p.m. — Oregon’s first first down since the first quarter comes inside the one-minute mark of the second quarter, but at least it comes at the hands of Colt Lyerla. Why is that such a good thing, you might ask? Because I get to type Spike Hammersmith because Colt Lyerla is in fact Spike Hammersmith all grown up, which makes Chip Kelly some more successful version of Rick Moranis, only Chip’s Little Shop of Horrors aired on Nov. 17, 2012, and instead of a twisted musical it was a heavyweight prizefight between two great coaches. And here, like the great boxer he is, Big Balls Chip dials up combo featuring an inside read to Barner for a first down, another seam-busting, heart-wrencher to Lyerla, then a busted check down (the off-balance haymaker, if you will — and you better) to Barner gave the Ducks a TD inside a minute. Oregon 22, Kansas State 7, :14 to play in the second quarter. Oregon offense: 158 total yards. Kansas State offense: 170 total yards. Marcus Mariota — 6 of 12 passing for 102 yards and 2 TDs. Three rushes for 13 yards. Kenjon Barner — Seven carries for 23 yards. One catch 24 yards and a TD. De’Anthony Thomas — One carry for 14 yards. Two receptions for 39 yards. 94-yard kickoff return to open the game. Colt Lyerla — Two receptions for 40 yards. 7:28 p.m. — Andddddd we’re back… to the tune of a Kansas State three-and-out. And IEO’s third down pass deflection was a big reason why (but even if it wasn’t, he still would get a name drop because there is no bipartisan claim to live up to in these parts). Oregon ball. 7:35 p.m. — Hey! Oregon looks fast again. Three plays, 40-plus yards, a big-time scramble by Mariota and Oregon appears to be back in business. 7:36 p.m. — If I was a DJ, Jinx would be part of my DJ name. Mariota mistakes Huff for an extra on the set of the unmade adaptation of Roald Dahl’s BFG on second down, and the Ducks settle for a field goal. Silver lining (the official sponsor of the 2012 Oregon Ducks. And yes, I know the date)? Alejandro Maldanado drilled a 32-yarder in a big game. So I’m giving him credit where mere baseline expectation was due, but with the state of the kicking game at Oregon, we’ll take what we can get. Oregon 25, Kansas State 10, 11:01 to play in the third quarter. 7:44 p.m. — While I was searching for an obscure Chris Rock clip on YouTube, Kansas State mounted another impressive three-and-out drive, then ran into Bralon Addison after he signaled for a fair catch. The officials correctly identified this contact as cheating and punished Kansas State accordingly (and by cheating, I mean they got called for a penalty, and by punished, I mean that Oregon was awarded 15 yards for the indiscretion. That’s what you get for messing with ACC officials). 7:51 p.m. — After a Mariota/Barner jackhammer of a drive (they both had runs of over 20 yards), Mariota punches it in from three yards out. Seriously though, I have to stop commenting on volatile entities within the universe. I’ll claim responsibility for the blocked extra point. Oregon 31, Kansas State 10, 8:03 to play in the third. 7:54 p.m. — Hold the phones. Kansas State apparently brought the ball back INTO the endzone on the blocked PAT before the play was blown dead, point Oregon. Oregon 32, Kansas State 10. 7:58 p.m. — There is absolutely nothing in Oregon’s second half gameplan that can be criticized, but I can’t help myself from wondering where DAT went. He touched the ball four times in the first half, and gained 146 yards. In the third quarter? Nothing. Let’s play an odds game called Where’s De’Anthony? 2 to 1 — Just not getting the ball. 3 to 1 — On the sidelines. 6 to 1 — Playing Call of Duty 4. 10 to 1 — Eating subpar pizza at Chucky Cheese (but only for the ball pits. Duh.). 50 to 1 — In a pineapple well above sea level. 100 to 1 — On a boat. 8:01 p.m. — Jinx working in Oregon’s favor. De’Anthony Thomas catches a football for a positive gain. We’re going places. Double down? Double down. Mariota and Huff nearly hook up for a 50-yarder, but a pass interference penalty makes it an all-for-something. 8:08 p.m. — Chip has to be savoring all these fourth down calls. As of tomorrow, he won’t be able to roll the dice with Wendover-worthy abandon. As of now, it’s to be expected. Mariota going down, on the other hand, is not. Kansas State ball. 8:17 p.m. — Bill Snyder just looks wise. I feel like I could learn something from his discarded nail clippings. 8:21 p.m. — Score one for the wise man, his first tally since five to play in the second quarter. Oregon 32, Kansas State 17, 11:35 to play in the fourth. 8:32 p.m. — There’s something to be said for Kansas State’s resiliency, but it won’t be said by me. Not because I’m not impressed, I just don’t quite know what there is to it. But I do know that they’re killing too much time. 8:34 p.m. — Oregon’s special teams are a circus. 8:41 p.m. — Kenjon Barner is back, ladies and gentleman. He’s put 142 yards on the night, 119 of which have come in the second half, making the winner in the odds game above “Making way for Kenjon Barner, the biggest beast of a back in a loaded Pac-12, on his last night in the college game — 3:2.” So that wasn’t listed, but luckily you didn’t put any money on it (or I’m assuming you didn’t). 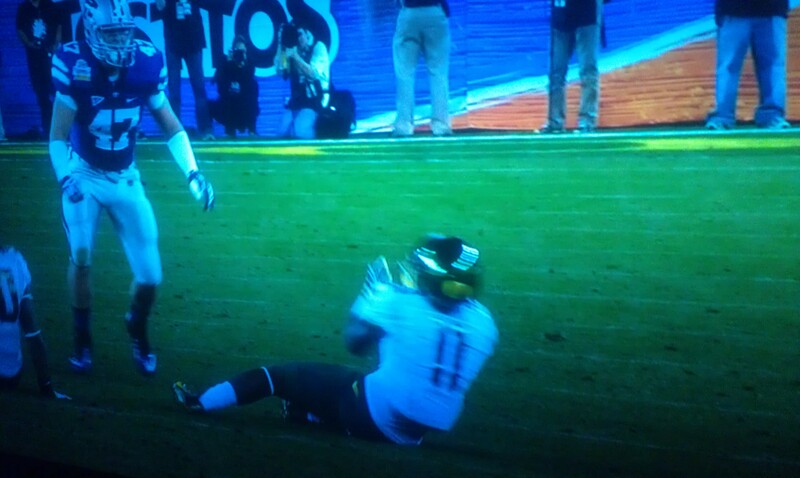 8:45 p.m. — Even with Barner’s fantastic effort, the Oregon’s O stalled bringing on… Maldanado! Who knocks it through! 2-2 for the much maligned kicker. It’s going so well for him tonight that his missed extra point even counted tonight. Who cares if he hasn’t attempted a kick longer than 32 yards, let’s not take it away from him. Oregon 35, Kansas State 17, 2:27 to play in the fourth. 8:49 p.m. — In a fitting capper, Erick Dargan, the newest member of Oregon’s free safety by committee, picks off Klein with two minutes to play, allowing Mariota to line up behind center in the only situation that allows him to. 8:51 p.m. — What a season, what a coaching career. Tomorrow, the new season, hunting season, begins. For the last time this season, Nelson, OUT.